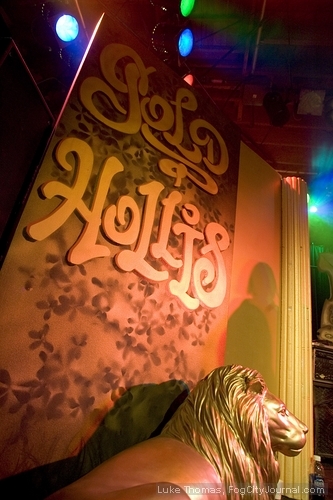 Last Thursday, March 12 a benefit was held at Slim’s in San Francisco for Hollis Hawthorne, a friend and fellow dancer. 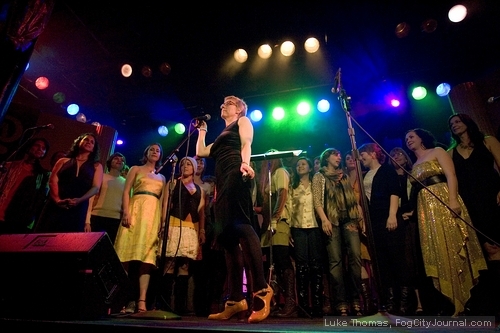 The event, which brought together her diverse communities of activists, artists, and friends, featured over one hundred performers on the stage throughout the night. Hollis’ story is relevant and moving during these daunting economic times because it is a story of richness of community, a type of wealth that does not lose value during a downturn. It is a shining reminder of what we can do when we work together. We titled the benefit “Gold Rush” to invoke things about both Hollis and the tragic circumstances surrounding her need. Gold is the color of Hollis’ hair. Gold is a precious thing. Rush implies the speed at which we had to act to help Hollis. And the Gold Rush was about looking for miracles in California. The Cheese Puffs spell out the name of one of their members in need. On Tuesday, February 24, while traveling in southern India with her partner Harrison, Hollis was involved in a tragic motorcycle accident. Although wearing a helmet, she sustained serious damage to her brain stem and fell into a coma. Others fled the scene and Harrison performed CPR on Hollis for 30 minutes on the side of the bridge while waiting for someone to help, until a van of German tourists finally stopped. Several clinic and hospital stops later, some of which were incredibly ill-equipped to handle the medical need, Hollis was stabilized in a hospital in Chennai, though still in a coma. at the beginning of their India trip. Hollis is a breathtaking dancer, a bicycle activist, a community-builder, a talented performer, and a muse who has touched many. She and I have danced together in several projects, including The Derailleurs, the Bay Area’s first bicycle-themed dance troupe that she founded, as well as Gold Rush co-organizer Molly Freedenberg’s Rockettes-style group called the Cheese Puffs. The day before her injury I received an email from Hollis that was about her excitement to dance with me in the new project I am currently incubating. Hollis is tough as nails and a free spirit, yet loving, solid, vibrant and – to everyone who meets her – completely unforgettable. 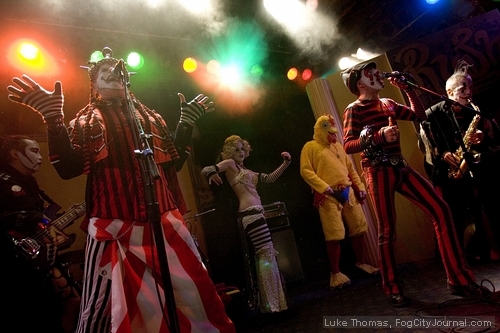 at the DNA Lounge, April 2008. Since her accident, although still in a coma, Hollis has improved – she is breathing on her own, squeezing her hands and opening her eyes. Miraculously, through Harrison’s mother’s connection to Stanford Hospital, Hollis was accepted there to receive world-class treatment as a charity case. However, we also learned the sobering truth that there would be a minimum pricetag of $150,000- $200,000 for transport from India in an air ambulance.We all knew Hollis needed to come home as soon as possible to breathe our sweet California air, home for the best treatment and therefore outcome, and home so she could feel her friends holding her hands and hear their voices. So Molly and I decided to organize Gold Rush in little more than a week’s time. 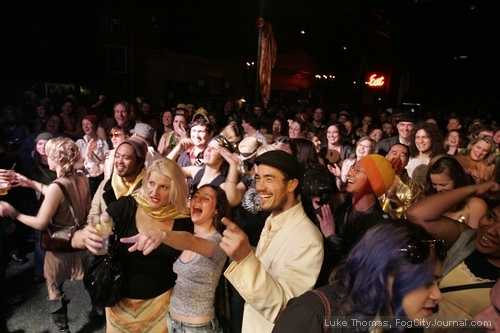 Gold Rush’s six hour line-up with over 100 performers was a vaudeville showcase of some of the Bay Area’s most exciting and fresh alternative music, dance, comedy and other acts. The benefit was emceed by Eliza Strack, Hollis’ best friend, Derailleurs co-founder, and superwoman organizer behind the Bay Area effort to bring Hollis home. Eliza Strack and Hollis Hawthorne, co-founders of The Derailleurs. 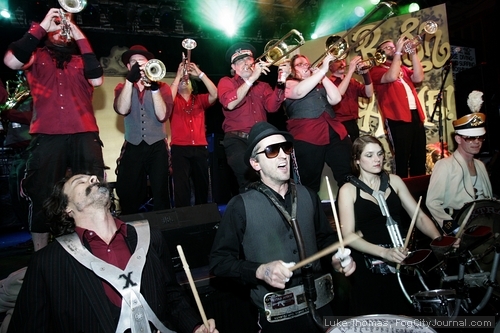 The always outrageous and often unpredictable Extra Action Marching Band headlined, along with Gooferman, a high-energy band of clowns becoming increasingly popular with the rise of indy circus culture in the Bay Area. Other musical acts included Valerie Orth Band, the all woman choir Conspiracy of Venus, Jessie Roadkill, One Fell Swoop, and Gilded Rooks. Melvin Ocasio delighted attendees with a puppet show and Flamenco air guitar number, and Chicken John caused roars of laughter with his live auctioneering prowess and unique prizes, some of which I probably couldn’t repeat here. Burning Man’s Will Chase curated a silent auction that included paintings, prints, drawings, fashion pieces by local designers, gift certificates, and various donated art and services. 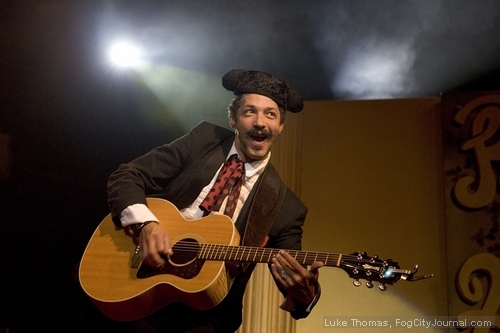 Melvin Ocasio delights with Flamenco air guitar performance. The Cheese Puffs perform Richard Cheese’s cover of Baby Got Back. 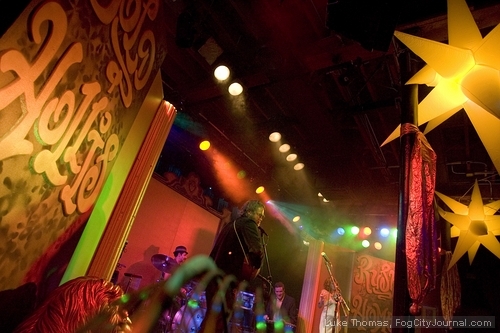 Pairs of tickets to Burning Man and Lightning in a Bottle festivals were raffled off onstage. 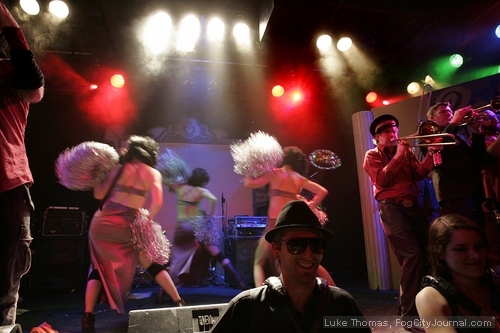 Hollis’ two dance troupes – The Derailleurs and Cheese Puffs performed throughout the evening. DJ sets by Stephan Ford (Jive) and Josh Lindenfelcer (DJ Wojciehowicz) provided bookends for the whole evening. All in all, the benefit drew over 400 attendees and raised $10,000 for Hollis, and still counting. Without Robert Levy, former owner of 12 Galaxies and superstar of stage management, there is no wayÂ such aÂ line-up could haveÂ happened so seamlessly. The Gold Rush crowd responding to Chicken John’s live auction. 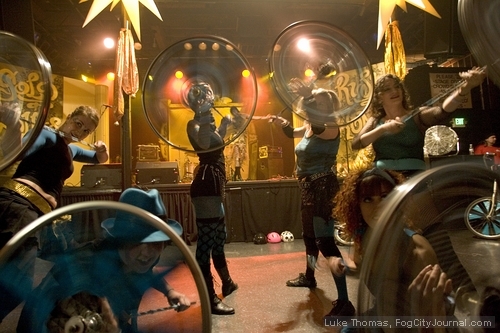 The Derailleurs, the bike-themed dance troupe co-founded by Hollis. The Cheese Puffs perform Welcome to the Jungle. The response to Hollis’ accident has been truly overwhelming. In addition to Gold Rush, there are benefits that have happened or are being planned in San Francisco, Oakland, New York City, Portland, Vancouver, Austin, Gerlach, Atlanta, Salt Lake City, Minneapolis, and Ottowa, and new cities seem to be added every day. Hollis’ story has been featured in two major newspapers in India, on television stations in Tennessee and San Francisco, and on blogs and online news publications around the world. Yoga classes for Hollis are being sponsored across the Bay Area. There have been remote healing ceremonies and chants to send health, energy, and love across the globe. All of my Facebook ‘friends’ are either writing or hearing about her story. In less than three weeks, we have raised over $120,000. The dancers, artists, bicyclists, burners, and activists, many of whom have little disposable money, have stepped forward and cradled Hollis in their arms, uplifting her and themselves to new levels. Hollis is reminding us about our limitless power when we work together. Hollis is reminding me of things too — of my compassion, of my community, of my power – as sometimes we end up questioning our value when we don’t hold a ‘real’ job. Interpersonal, social, and community investments do not lose value, though, during a downturn. I have worked on many political campaigns and causes, but this one has touched me in ways that are new, powerful, and incredibly reaffirming of how I spend my time and energy in this life. 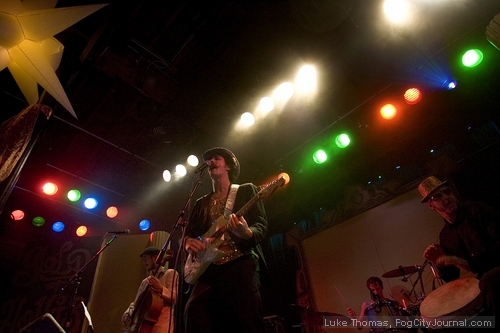 The immense and rapid response for Hollis taking place in our city’s subcultures and artist communities — most of the donations have been small increments – has that same kind of energy and optimistic overflowing of community that Matt Gonzalez’s mayoral campaign had in 2003, as well as did Obama’s paradigm-shifting campaign for President. So although this is Hollis’ story, it is simultaneously writing itself to be the community’s story too. When Hollis wakes up from her nap, it is going to take some effort to explain to her the immensity our response!! However much is donated to Hollis, she will no doubt give back to the world a thousand fold. She will reflect our own golden light back at us even brighter. As I write this for FCJ, Hollis is being admitted into Stanford Hospital. We received word on Saturday that a flight had been secured for her and that she would arrive at SFO on Monday afternoon. Although her flight is not as costly as the full-priced air ambulance, every penny raised to date and raised in the future is desperately needed to pay for her bills in India, for her family’s and Harrison’s expenses, and most importantly for the unknown and possibly lengthy recovery ahead. Harrison playing guitar for Hollis in her hospital room in India. 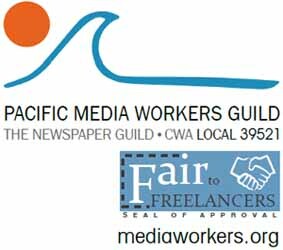 The initial frenzy since her accident of setting up websites, spreading her story, organizing donations, and putting together the Gold Rush benefit is over. But that does not mean that Hollis’ story is anywhere near done. For the first time today I let myself do some reading about traumatic brain injuries like the one she has, and of the process of coma recovery. It was quite sobering. It might be a lifelong process that requires significant care and assistance, it might be a miracle 100% recovery, and it might be anything in between. Like the gold miners who preceded us a century and a half ago in California, we are going to try our hardest to make miracles happen. But of course nothing is certain. What is certain, though, is that this tragic story has brought an incredible number of people together to do incredible things for a priceless woman — a golden gal named Hollis. It has also reminded us of some priceless lessons about the true wealth in our relationships and our communities in the face of challenging times. Palo Alto Daily News story on Hollis and Stanford Hospital’s donated care. 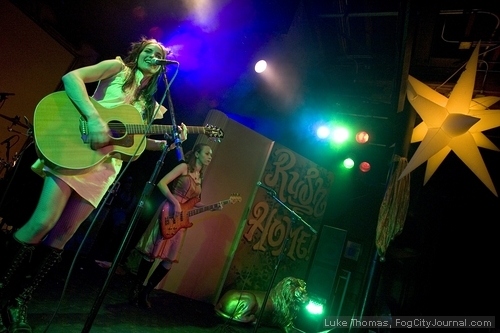 Cat Rauschuber is a dancer, writer, and woman of action in San Francisco’s political, environmental, and cultural arenas. She has her Masters of Public Policy degree from Harvard University’s Kennedy School of Government and resides in the Mission District. The author would like to express her gratitude to FCJ’s Luke Thomas for photographing Gold Rush, as well as for providing a forum for the further spread of her friend Hollis Hawthorne’s story. A Tale of Immense Riches During Hard Times are now closed.